Totally Awesome Dogs! LLC specializes in positive rewards dog training in Santa Fe and the Eldorado area of New Mexico. Deluxe Doggie Daycare and Boarding are available by appointment. Animal Communication Sessions are done by e-mail or by phone. We teach you and your dog through enjoyable private lessons. Dog/human teams are taught with positive, reward based methods - NO harsh corrections. True success comes from the relationship you have with your dog. You will learn how to become a calm, confident leader and train your dog in a way that is loving, compassionate and FUN! This will have them practically begging you to "work" with them. With some behavioral issues one or more animal communication sessions are required. Classes are not currently being offered. Introductory session - $15 for 20 min. PRIVATE LESSONS $75/hour Buy 6 get 1 Free! Purchase six private training sessions for your beloved dog friend and get the 7th one FREE! (when paid in advance) Multiple dog households - same price! ALL PRICES FOR ANY SERVICES INCLUDE TAX! Cash, Paypal and checks are gladly accepted! Please make all checks payable to: Totally Awesome Dogs! Dogs are our hearts outside of us. Rosie says "Welcome to my house - glad to meet you!" Make a special connection with any animal. 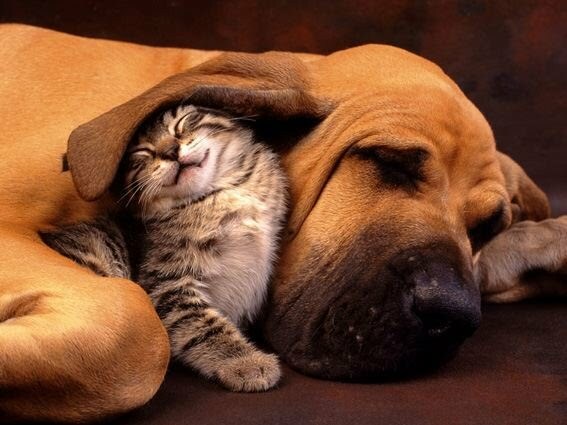 It's so nice to have a friend to snuggle with!